Introducing... The Austrian Philatelic Society and the world of Austrian Stamps! Hello, Grüß Di, and welcome to the Austrian Philatelic Society (APS) site, where you'll find details of its activities and publications, as well more general information on Austrian Philately. These pages are written by Andy Taylor, the Editor (and Webmaster). Index of the APS Journal "Austria"
NB: We are an entirely separate organisation from the Austria Philatelic Society (US), although we have a working relationship with them. 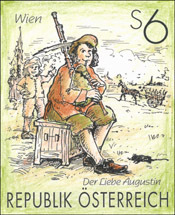 Until 15 October 2000, the APS was called the Austrian Stamp Club of Great Britain. To ensure you are looking at the latest version of the pages on this site, use the "Browser Refresh" feature (for Internet Explorer it's the F5 key). This applies especially to the Bookshop and Auction pages. Getting in touch via email: Click one of the boxes below. Don't make up other addressees (eg 'sales') as the spam filters will eat your email! Also check that you have supplied a return address that can accept emails from unknown senders. Please do not include an attachment with your first email as it's likely to be deleted unread. ** Note: if you use Gmail, replies from these Officers will probably land in your spam folder!